Busscar Ônibus S.A. was a Brazilian bus manufacturer that was building coaches, trolleybuses, charter and tour buses. The company was based in Joinville in the south of Brazil, where it was industrial premises that cover 1,000,000 m2 (11,000,000 sq ft), including a building of 84,000 m2 (900,000 sq ft). Urbanuss Pluss trolleybus in operation on the São Paulo trolleybus system. The business has its origins in a firm created on September 17, 1946, when two brothers of Swedish descent, Augusto Bruno Nielson and Eugênio Nielson, opened a carpentry shop in Joinville, where they made wooden furniture, window frames and desks. One year later, Nielson & Brother remodeled the first bus body. In 1949 they built a bus body entirely in wood, attached to a large Chevrolet chassis. This was the starting point of a business that in a few decades would turn into an important bus manufacturing company in the worldwide market. When Harold Nielson (Augusto's elder son) joined the company in 1956 it was en route to becoming the segment leader in Brazil, with innovative and revolutionary products, such as the Diplomata model in 1961, the Urbanuss in 1987, the Panorâmico DD in 1998, and many others. In 1990, the business, by then called Carrocerias Nielson, launched a new family of vehicles and changed its name to Busscar Ônibus, creating the mark that is known today in international and Brazilian markets. 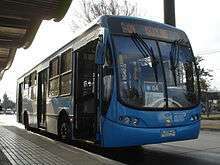 On 27 September 2012, the Brazilian Judiciary of Santa Catarina declared bankruptcy of Busscar due to the effects from economic crisis of 2008. A Bus produced by Busscar appeared on the tenth episode of the fourth season of Showtime's series Homeland (13 hours in Islamabad). Wikimedia Commons has media related to Busscar vehicles.